It is not often when a reader comes across something original, so when that piece not only comes along, but it is also excellent writing, that book needs to be grabbed and devoured. 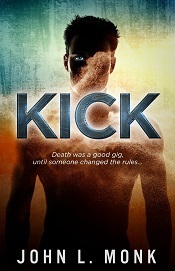 "Kick" is just that kind of book. I have never read a storyline even close to this, and I enjoyed the author's treatment of it. The premise of the book is that Dan, the protagonist, committed suicide, and as a penance, is periodically sent back to the world to inhabit bodies of bad guys so he can right wrongs. These people are basically the scum of the earth, but just what they are doing that needs addressing is not immediately apparent to Dan when he takes over their body. While he is blessed/cursed with total recall of everything that has happened to him, once he enters a body, he has no idea about that person's life-story. He has to investigate the situation while playing that person, not arousing suspicion from those around him (usually very bad people in their own right). The writing was engrossing. I found myself diving deep into Dan's world, into his tasks. Dan does what he has to do, or at least what he thinks he has to do. Both Dan and the reader are never quite sure just exactly what is expected of him. We can only assume that he is carrying out the purpose for which he is sent back. That leaves a nice bit of literary tension throughout the book, especially in the last third of it. Characterization was good. Dan was a compelling protagonist. I liked the irreverent side. It was funny, but not over-the-top. I laughed out loud when the contrary character shouted out "Sitting Bull" while parachuting. It was a small touch, but a strong one. Editing was uniformly good. It was a pleasure not to be bombarded with typo after typo as I have with some other books recently. If I had to think of one word to describe the book, it would be "fun." But that would shortchange some very real and somewhat deep philosophical issues with which both Dan and a priest must deal. I had to slow down my reading to contemplate some of these issues, yet they did not bog down the storyline or tempo. Kick was a very nice surprise. This is the kind of book that any serious reader will treat as an unexpected treasure. For more reviews or to buy Kick from Amazon.com, click here.